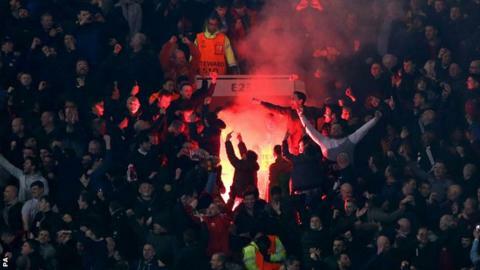 Manchester United and Liverpool are expected to discover next week if they will face more charges for illicit chanting at their Europa League tie. Some fans of both clubs sang songs related to tragedies involving the other side in the 1-1 second-leg draw at Old Trafford on 17 March, with Liverpool winning the tie 3-1. Uefa has already charged both clubs for crowd trouble, and Liverpool for illicit chants - reportedly critical of Manchester, rather than referring to the Munich air crash. Europe's governing body was then made aware of the allegations of chanting about that disaster and the Hillsborough tragedy - and is expected to make a decision on possible new charges next week. In 1958, eight Manchester United footballers were among 23 people who died after their plane caught fire and crashed in Munich. The Hillsborough tragedy saw 96 Liverpool fans crushed to death at an FA Cup semi-final tie with Nottingham Forest in 1989. The initial charges will be heard on 19 May.